My friend PJ got himself this sweet Sycip touring bike. 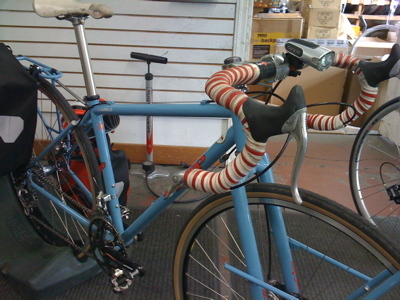 The bike is 700C steel with disc brakes and front and rear racks. There are a lot of cool details that went into the construction, but Jeremy keeps it real and functional. 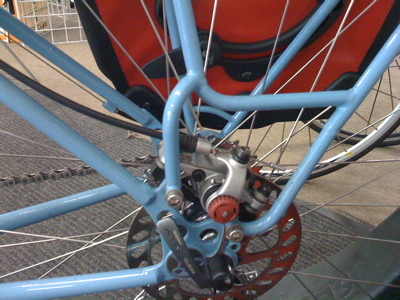 Note how Jeremy re-shaped and welded the disc side of the Tubus rack, which was powdercoated to match the frame. PJ really wanted the Sycip signature disc tab dropouts on his touring bike, so Jeremy re-made the rack to go around the disc’s caliper. Really nice.